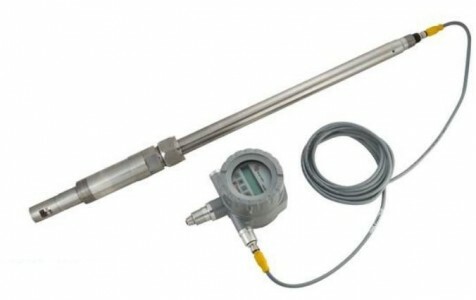 The VN2000 Compact and Hot Tap Insertion Vortex Flow Meter measures the volumetric or mass flow rate or BTU/energy of steam, gas or liquids over a large flow range. Within the flow meter as flowing media moves across the strut or "bluff bar" vortices are shed. The meter transmits an ultrasonic beam through the vortex pattern downstream of the strut. As vortices are shed, the carrier wave of the ultrasonic signal modulates. The modulation of the carrier wave is measurable and proportional to the number of vortices shed. Digital processing enables the vortices to be counted, and this value is converted into a velocity.